The amateur radio license exam practice applications on this site offer two features. First, they provide practice exams randomly constructed from the actual examination question pools. Second, as each exam question is displayed, study materials related to the question are displayed as well. 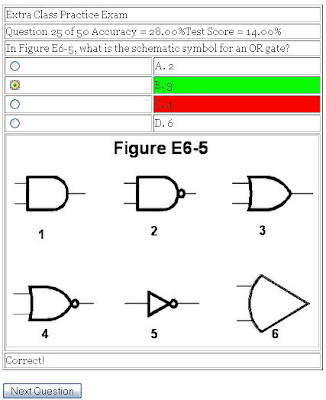 The exam practice screen is shown above. A question is presented along with four multiple choice answers. A correct answer will be highlighted in green. If the wrong answer is selected, it will be highlighted in red. Additional answers can be selected to determine the correct answer, but only the first selected answer will count in the test score. If exam question requires a figure, it will be shown below the multiple choice answers. 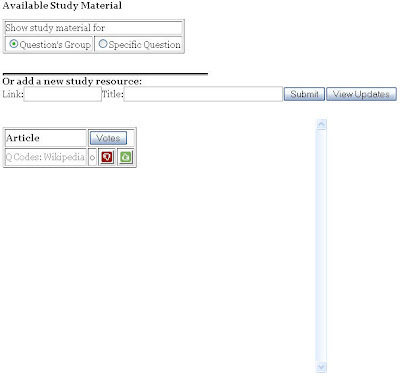 As each question is displayed, related study material may be displayed in the 'Available Study Material section of the page, (shown below). into the 'Title:' field and click the 'Submit' button. Usually, your newly added resource will be reflected on the page immediately. If not, then click on the 'View Updates' button to see the new resource you added as well as resources added by other users. The exam questions are hierarchically organized into groups of related questions. By using the 'Show study material for' controls, you can view study material related only to the specific exam question shown, or the material linked to every question in the exam question's group. You can also rate study materials. If you particularly like a resource link, click on the thumbs up button. If you don't like it, click the thumbs down button. The accumulated votes of all users are shown beside the study resource link.